One could come up with a long list of negatives about religious life in the 21st century, but Sr. Amy has taken the higher road and convincingly portrays the possibilities inherent in communities founded and empowered by the Spirit. Her views of religious life in an emerging church are based on the no-longer viable structures of pre-Vatican II Church. Her candor in exposing the masculine influence that has led to the disintegration and disruption of women’s religious communities is relevant for the restructuring of postmodern religious life. Her future-oriented chapter on ‘New Forms of Religious Life’ should be required reading for everyone in consecrated life or contemplating it and very every bishop—and that includes Pope Francis. I am so grateful to be part of the conversations about the future of religious life. 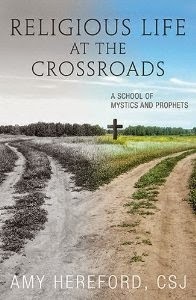 We are indeed at a crossroads, and we have before us an abundance of opportunities for creativity in responding to God's call to Gospel living. We gathered for our regular quarterly call to share the Spirit that is stirring among us, and to talk about future oriented initiatives for religious life. Summer Sisters - plans are underway for a few sisters and a few young lay women to share the values of religious life in intentional community this summer. Vision Space will be a gathering of young and middle aged sisters to share the experience of religious life today. Sisters 2.0 is being launched as a Facebook page for post-Vatican II sisters to network, envision and live into the religious life of the 21st century. If this is your conversation - contact me for details. Mapping We have a proposal to reach out and identify the sisters in the post-Vatican II cohorts of religious life so that we can network for mutual support and build relationships. We will check out Sisters of Earth to see where their vision and goals may intersect with ours. We are still thinking of how to celebrate the Year of Consecrated Life in 2015. The call was energetic and hopeful as we shared where we come from, and where we are going in this great adventure we call religious life. Neo-Tribalism means many things to many people, but essentially it refers to the human tendency to form communities in human-size groups, even when our social structures group us on a mega-level. It is seen as a symptom of post-modernism. Moderns attempted to solve all the world's problems with bigger and better organization, post-moderns commit to local communities and needs. Neo-tribalism also acknowledges that the best communities are not insular and isolated. Instead, they have a center of gravity within and a sense of identity, and at the same time, they engage others in meaningful ways. I think that religious life calls me to think in new ways about community. Large groups of elder Sisters embrace the reality that their congregations are in their last years, their amazing stories are coming to an end. Small groups of younger Sisters come together in small local communities where we belong, grow and share as the image says. We find places that nourish relationship and our capacity to encounter God, to encounter one another in community and to encounter others in mission. In this I find life, energy and hope. It is a blessing to be at this point of dying and rising in the history of religious life.